Power up with the latest HVAC & Refrigeration technology, innovation & knowledge. 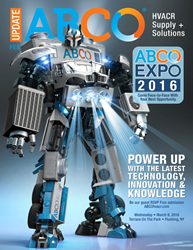 ABCO HVACR Supply + Solutions invites all HVAC (Heating/ Ventilation/Air-Conditioning) and Refrigeration professionals to the ABCO EXPO 2016, at Terrace on the Park in Flushing, New York, on Wednesday, March 9, 2016. Show hours are 12:30 pm to 8 pm. Admission and parking are free. The show is also open to developers, builders and students. Over 200 exhibits and 5,000 attendees are expected to be on hand. All the advantages of the New Mitsubishi Electric Kumo Cloud Controller App, and the latest Hyper-Heating and high value ductless systems. The event also includes generous promotional giveaways and a tantalizing comp meal. A variety of valuable prizes will also be raffled off with the proceeds going to Make-A-Wish. The ABCO EXPO exemplifies the company’s ongoing commitment to sharing knowledge and providing outstanding service to its customers and communities.